Q. Could you explain current politics? A. There is a rise of fascism in many countries. It is to do with the collapse of the old ways and the beginning of the successes of the new. The situation will turn for the better soon. The storm is nearly over. It’s losing its intensity, according to my Master, even if we do not recognize it yet. Q. Are the Masters surprised at the level of conflict at present? Q. Could you say whether there are other factors involved? A. One pressing problem is that of over-population. The world is not big enough to support the present world population. The population is growing very rapidly. There is a struggle for supremacy of space. Turmoil is nearly always the result of the change from one Cosmic state to another. So many people are still tied to the old ways. Chaos results from the movement from the old order to the new. My Master says: “A lot of people are too worried or too unaware to recognize the need for another way of acting and being.” Neither do they notice or recognize the decrease in the intensity of the present difficulties. Q. Are the Shamballa energies stronger – especially over the last one to two years; is that why there is a lot of tension and conflict? A. Maitreya is omniscient and omnipresent. Nothing happens anywhere without His knowing it. It says in the Bible that if a little leaf or bird falls to the ground, God knows it. Maitreya is not God – except that we are all God – but He is more aware of the nature of that divinity than we are. That is the difference between us, but it is a difference only of circumstance and opportunity. He has been at it for so much longer than us; literally for millions and millions of years, and He has never made a mistake. So He is able to do what we think we are unable to do. But we are divine: Maitreya says everyone on Earth is divine, everybody is needed, and every single person counts. So He comes to teach humanity the simple art of living: living from the inside out, instead of living mechanically from the outside, following governments who follow specious things like the market. The market, Maitreya says, is blind, and the politicians are blind men following the blind markets. He says they will lead you to the edge of a precipice. He comes to make sure we do not go over that precipice. They also draw attention in an amusing way to some fixed intolerance to, for example, smoking or drinking. At times the Masters act as saving ‘angels’ in accidents, during wartime, earthquakes and other disasters. They use a ‘familiar’, a thoughtform, who seems totally real, and through whom the Master’s thoughts can be expressed. They can appear as a man, a woman, a child, at will. Occasionally They use the ‘blueprint’ of a real person, but in most cases the ‘familiar’ is an entirely new creation. Some of the experiences described in the letters printed here happened after Benjamin Creme’s death and have not been confirmed by his Master; we have included them because they seem significant and relevant to our work. Since Benjamin Creme died in October 2016, the London group working with him has continued to hold monthly lecture videos at Friends House, Euston Road, London (the venue where he gave talks for over 40 years). We are steadfast in our job of presenting the information to the public, but many people sadly miss BC’s presence with his unique insights, wisdom, blessings and sense of humour. Many attendees express gratitude and support for our continued work and encourage us to “keep going”, as BC would say. At the Friends House event on Thursday 18 May 2017, a young black man came, whom we had not seen before. He was perhaps in his late 20s, and wore casual clothes and a beanie hat. He had a short chat to all the co-workers helping and everyone remarked how gentle, friendly and interested he was. During the introduction to Transmission Meditation he began to meditate immediately. He looked blissful and completely at ease, although he said he had never done this type of meditation before. After the event finished and we were starting to pack up, he came over to me. With his right hand clenched, he pointedly tapped his heart as he said: “I am very sad that Benjamin Creme is no longer here. But the most important thing is the message, not the messenger.” I replied: “Yes, but what a great messenger he was.” To which he replied: “Yes. But the most important thing now is the message. Please let the others know.” He smiled and left. Our encounter with this young man left us feeling uplifted and reassured that we are on the right track, and that in these turbulent times, our message and information about Maitreya is needed more than ever. We had an interesting visitor at our first Transmission Meditation workshop of 2017 on 9 February in Edinburgh: a youthful black woman dressed in smart, casual clothes arrived last while the others were already seated. Her ways were positive, joyful and enthusiastic. This was an important point for us as we had recently experienced a situation of conflict in our group that was proving a very unsettling time for everyone. One group member thought straight away that it was a sign to uplift the group and the situation we had recently been experiencing, and thought “That’s what we need, what the group needs now, with that positive attitude, like a boost!” Another wondered if this could be Maitreya advising us how to resolve conflict in a group. There were a number of other examples that made us feel the young woman could be a ‘special guest’. When we explained aspects of Transmission Meditation she always seemed to correctly understand what we implied and had an intuitive perception of what was meant: she frequently commented with positive, happy, and enthusiastic remarks. When a group member was explaining about The Great Invocation and the use of the term Christ by saying that Christ was not just about Christian teaching but that it was about.... “the Divine” interjected the visitor. On the Full Moon Meditation, she was very enthusiastic to learn that we had meditations at the Spring Festivals, saying she really liked full moons and that this was an important occasion. She said she “appreciated and was humbled by a group member’s laughter and another member’s ability to laugh.” One group member thought this was about the conflict in the group and the need to laugh to make the situation less worrying. On meditation, she said: “I always thought that meditation did not interfere with other practices.” Before the Transmission Meditation started, another visitor had intervened by saying that she had decided not to take part as she was feeling that what was said was against her principles and beliefs. Our young visitor intervened by saying that that was fine, that she could leave if that was the right thing for her to do. She said, “We wish you well”, as the girl was getting up from her chair and leaving the room. At this point it seemed as though she was the one directing the workshop! After we had conducted the meditation, our visitor asked how long we had been doing Transmission Meditation. One of the group members said he had been doing it for 20 years but still found it difficult to do. She replied that development usually takes place between 20-40 years (not the first 20 years) and that she had read about a breathing technique that took 40 years to master. She told us she was studying economics at Herriot Watt University in Edinburgh, and that a project she was involved with, and her mission, was to ensure that everyone has access to clean water and that water should not be wasted. This was very important for future generations. She concluded by wishing everyone well and being a bit cryptic when a group member asked if we would see her again; she replied that she lived each day moment to moment and could not say what the future held. But she said she was sure we would meet again some day. We all thought the encounter was wholly positive, and was how Maitreya would actually deal with conflict in a group – with a positive, uplifting, respectful and non-critical regard for everyone. From members of the Edinburgh Transmission Meditation Group, Scotland. At Asahi Hall in Tokyo on 14 May, a man in his 70s came in towards the end of the talk. He was wearing a worn-out jacket and stained business shirt. In spite of his shabby appearance, I was struck by his eyes – the pupil of his eyes had many layers of clear black, and a bluish ring around the black; he also had a beautiful smile. He talked some more with others, then, as he crossed in front of me, he suddenly mumbled without even looking at me: “This is the last one, you know.” These words were spoken suddenly without any connection to any other conversation. “What? This is the last one?” I thought. These words had a special meaning to us workers. I don’t know if it had a special meaning or not, but it gave me a chance to stop a moment to re-evaluate my attitude towards the work. At Yomiuri Hall in Tokyo on 20 May, I noticed a middle-aged man in the lobby during the recess, because he was wearing striking yellow clothing (the same colour of yellow that we used for our posters) from top to bottom – yellow shirt, yellow trousers, yellow full-length coat. I was so taken by his clothing that I watched him from a few steps away. Then he began to walk away, and suddenly disappeared. I ran after him but he was nowhere to be seen. In the lobby of the lecture hall, we provided tables with books where people can sit and browse through Benjamin Creme’s books. At Yomiuri Hall in Tokyo, a middle-aged man came to the book table during the break, looking quite inspired and excited, and began to talk to me, pointing at the book that said on the cover “The future of humanity is bright”. “This is it! This is it! We are already in the bright future. You all have worked hard for a long time, but it is all right now.” He then said thoughtfully, “Most people are so poor…” and he began to cry, as if he was overcome by gratitude and hope and deep sorrow. On the morning of 10 June I woke up from a dream where I and some friends were outdoors and all of a sudden a fleet of jets flew over us at great height only to fly a lot closer a bit later and then soar straight up into the sky. The jets were white, radiant and totally silent so I thought immediately they were space brothers, not jets. And soon enough they made one more pass at some height and this time they dropped thousands of parcels on parachutes, like you’d see in aid being delivered from planes, and one of the parcels landed on a roof nearby. I climbed to fetch it thinking this is something important. The parcel contained rather small leaflets, that apparently were adverts for an upcoming movie featuring old black and whites, and there was a date that I didn’t quite get in the dream but it was in the near future. I immediately put two and two together and knew that this was a flyer saying Maitreya’s Day of Declaration would be soon. I’m writing this down in the hope that other group members might have had similar (dreams) and this might have been one of many such signs for the group. (1) On 29 April 1998 during the early morning hours, I was awakened by a kiss on the forehead. Opening my eyes I saw what appeared to be the top section of Christ’s body. Could this have been a visitation? If so, will he reveal to me any special reason for this? I was living in Dallas, Texas, at the time. (2) In the early summer of 2001, my doctor and I could detect a small lump in the left breast. While undergoing a mammogram, I felt an overwhelming urge to whisper “Jesus”. Upon saying “Jesus” there appeared a very bright light in front of me. The lump is much smaller and the doctors are only ‘watching’ it. Could this be a miracle from Jesus? I went one Saturday to Office Depot to prepare flyers for my spiritual teachings and talk at a church on Sunday in NC. A man came up to me, called me by name, that was the same as your description of Maitreya – golden skin, olive eyes, tall, thin, and the feeling of being in his presence was one of pure love and knowing him. He kept showing me his papers that had the image of the holy spirit on them and asked me to look and see if they are clear enough. He then picked up one of my flyers and looked into my eyes and said, “Thank you, thank you, thank you.” He followed me out of the store but when I went out the front door, an eagle soared from the door right over my head. I stood there for more than 15 minutes and the man never did come out of the store. The next day at church a flash of bright light went off between me and the congregation. After the service a woman came up and asked me to pray for her. I did and she instantly regained her hearing after being deaf. I know it was either Jesus or Maitreya that appeared to me and at the church. Can you confirm? We present a selection of quotations on the theme of ‘The people awaken’. The quotations are taken from Maitreya (Messages from Maitreya the Christ and Maitreya’s Teachings – The Laws of Life), Benjamin Creme’s Master (A Master Speaks and Share International), and Benjamin Creme’s writings. The present is a time of crisis and promise. The New struggles to find form. The Old strives to survive amidst the destined change. Humanity is ready for the next step; the long sleep is ending; the sleepers awake. The call to freedom and joy echoes in the hearts of the peoples and stirs them to action. Take heart, therefore, from all of this, and know that new and better times are on the way. Take heart and know that naught can stop the momentum of change that now grips this world. Leslie Kean is an investigative journalist and author. She wrote The New York Times bestseller UFOs: Generals, Pilots and Government Officials Go On the Record (2010) (Reviewed, SI, January/February 2013). Her most recent book is Surviving Death: A Journalist Investigates Evidence for an Afterlife (2017). 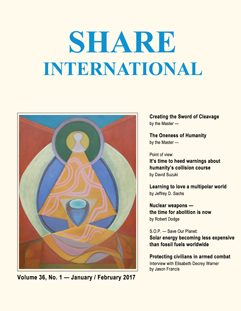 Jason Francis interviewed Leslie Kean about her research into life after death for Share International. Share International: Could you talk about some of the more memorable cases of reincarnation that you came across in your research? Leslie Kean: There are two that I featured extensively in the book. The cases that are most evidential to me as a journalist involve really young children who have specific memories and are able to provide enough details so that investigators can find the person the children say they were and confirm that the information they provided is accurate. If somebody just has memories that can’t be verified, it doesn’t mean a whole lot. But it’s very compelling when you can locate the person they claim to have been and find out that everything they said was accurate to the life of that person. One of the cases involved a two-year-old boy named James Leininger. He began having memories [of a past life] before he was two. A long series of events occurred over a period of about two years when he became obsessed with playing with airplanes, and demonstrated knowledge of World War II aircraft. James started to develop nightmares in which he was reliving the crash of an airplane. He was in terror and shrieking in his crib. Eventually he started to articulate what was happening. During his nightmares he would scream: “Airplane crash on fire! Little man can’t get out!” At certain times his parents would ask him questions about what was going on. Over time he was able to communicate that he had been a pilot who was shot down by the Japanese. His parents didn’t know how their two-year-old son knew the word “Japanese”. James talked about how the little man in the plane was him. He said he flew a Corsair, which is a specific type of aircraft, and that it flew off of a boat called the Natoma [later confirmed to be the aircraft carrier USS Natoma Bay]. Even more specifically, he said that he had a best friend named Jack Larson, and that his plane had gone down near the island of Iwo Jima. One day James’ dad was looking at a book about World War II with him and saw a map. James pointed to the map and said that was where his plane went down. His dad was going through a lot of trauma around all of this because he was of the Christian faith and was absolutely convinced this was not possible. It was not part of his religion. He was determined to prove his child wrong, but anytime he looked into these memories he found them to be accurate. James’ dad actually wrote some excerpts for my book about his own spiritual progression through this, and how he came to realize by the end that it didn’t contradict his faith and he was able to accept it. That’s an interesting component to the case that many parents will relate to. Eventually James’ father went to a series of reunions for people associated with the aircraft carrier USS Natoma Bay. He found Jack Larson, his son’s friend in his past life. After much research and talking to a lot of World War II veterans, he was able to find out who the person was that James had memories of being. His name was James Huston Jr. He died as James Leininger described. When James was about three he began to draw many pictures of his plane crashing in horrifying situations, on fire and with bombs all around. He would always sign them “James 3”. When his parents asked why, he would say: “Because I’m the third James.” His dad was shocked when he found out the pilot was named James Huston Jr., as the “Jr.” implied that the current James was the third one. They also met the older sister of James Huston Jr., who was 84 at the time. She connected very well with little James. And he was able to tell her a lot of details about their childhood that she said he couldn’t possibly have known. She became convinced that James was, indeed, who he said he was. It’s one of the strongest cases we have on record of a small child with specific [past life] memories. All of these memories were documented by his father before they were able to determine who James was in a past life, which is an important element. SI: What happens when someone experiences consciousness outside of their body? LK: There are two facets of these experiences. There are veridical out-of-the-body experiences and near-death experiences. As a journalist the out-of-body experiences are more important as evidence. The important ones involve people leaving their body when they have no brain activity, such as being in cardiac arrest, have no heartbeat and are essentially clinically dead. When they come back, they are able to report specific things they’ve seen or heard in the physical environment when they say they were out of their bodies. They often describe themselves as being near the ceiling. They can accurately describe what the doctors were saying, the tools they were using, sounds from the machines and things like that. And this was at a time when they weren’t supposed to be able to perceive anything at all, with their bodies lying on a table, their eyes closed. Those cases are important because the doctors and nurses can verify the accuracy of what the person said. Therefore, it has to be explained how they could have perceived these things. The suggestion is that their consciousness was, indeed, operating independently of their body while they were clinically dead. The near-death experiences involve people who, once they left their body under similar circumstances, journey to another, sublime dimensional reality, which they come back and describe. It often involves going down a tunnel, seeing some kind of a mythical Being, and speaking with dead relatives and friends. It’s described as being a heightened reality. They often say it seemed more real than real life did – a vivid, beautiful, ecstatic experience. They usually don’t want to come back, but are often told they have to. These experiences happen to people from different cultures and backgrounds all over the world. Many studies have been done, but no one is able to explain how they happen. Plenty of skeptics believe something is going on in the brain. However, the people who study them don’t have any model that can explain all the facets of the experience. They are also life-changing for the experiencers. After they have been in this other realm that they believe to be the afterlife and come back, they are no longer afraid of death. Often they make drastic changes in their life, become more focused on being of service to others, and more spiritually oriented. It often has a profound effect on people…. In tribute to Benjamin Creme, an artist far ahead of his time, Share International presented a Special Feature focusing on his paintings and his development as an artist. A series of articles, each quite distinct in approach and range highlighted various aspects of his work and extraordinary contribution. Intriguing and new autobiographical material was included revealing Benjamin Creme’s intimate relationship with his Master and how that permeated and informed his paintings which radiate extraordinary energy. We offer here a brief glimpse into some of these articles which make this particular issue a true collector’s item. Around 1964 Benjamin Creme’s art began to change radically. This was a period in his life between his momentous pledge to work for Maitreya, after having been telepathically contacted by his Master but before he was asked to take on this work fully during a period of intensive training from 1972. BC’s contact with his Master was still private and personal, and he rarely spoke about it. He had worked closely with the Space Brothers but this had now come to an end. For around 10 years he was comparatively free to concentrate on his painting. Benjamin Creme’s painting had been, as he put it, a personal gift he was born with and that he had come to know about early in his life. When he was 13 he came across a stub of a soft pencil on the ground and discovered how well he could fashion light and shade with it and his art teacher praised it. It was a revelation for him. He did not know until much later that the pencil had been placed there by his Master – but from that time he determined that his vocation in life was to be a painter, and he worked hard at it with no encouragement from his family…. BC’s portraits from his early 20s, often vaguely cubist in style, were outstandingly mature and accomplished. Many also had a rather particular quality in their appeal to the viewer: a blending of precise, carefully wrought formal features with a disarming tenderness. For the next two decades he painted mainly portraits and later landscapes. And although the contact was not so far conscious, his Master was never far away, as is apparent in BC’s painting of The Prophet, 1942,painted when he was only 20. The change in BC’s work as it evolved from around 1964 was dramatic: from the abstract landscapes that he was now painting to what has become known as his ‘esoteric’ art, which Share International readers are familiar with, and which he presents in the booklet issued by the Japanese groups linked with the lithograph reproductions of his work. Those familiar with Benjamin Creme’s painting will know that, for ease of reference, his output can be divided into two great periods – his predominantly figurative work before 1963/64, and his abstract work thereafter. While there is no doubting the contrast in the subject matters of the two periods – the physical world and then the symbolic world of esoteric meaning – there is also an overarching trajectory that unifies all of his painting, making it all the expression of the same singular, continually expanding artistic vision. In particular, his work is marked by a unique way of handling abstraction. Creme once stated that he was drawn to abstract expression from very early on. During the 1950s, he devoted a great deal of time and effort to the painting of landscapes, which of course are subjects visible to all. Yet if we look at a remarkable work in this genre from that period, Rain on Hills, South of France (1950), we see a marvelously abstract handling of what is essentially representational painting, a deft and balanced blending of the two. While this in itself is not entirely unique, his way of doing it is. His way of rendering mountains, clouds, terraces and so forth, are all infused with a solid and vigorous personal sense of form and abstraction. Certainly, these qualities can also be seen in works of his second, esoteric period, where the robust handling of form is now at the service of an entirely symbolic subject matter. A mastery of large-scale form is combined, when necessary, with a striking delicacy, evidenced by the detailed brushwork and subtle rendering of the play of various energies in works like Flame-Coloured Deva (1976-77) and Central Spiritual Sun (1975-77). One of the works that appealingly combines qualities of both periods is the exceptional Oracle from 1984, an esoteric abstract which exhibits a formal and compositional integrity combined with a touch of the wit of Paul Klee, an artist Creme was known to admire…. As many people who have worked with Benjamin Creme can testify, he was a great teacher to be around; not by giving any regimented lessons, but by his living example of how to ‘be’. Through working with him and observing him in action, certain qualities shone through which were inspiring and illuminating…. Through his writing and teaching, and by his living example, BC demonstrated how to prioritize service activity and focus in these pressing times, yet at the same time be detached and ‘outside of time’ – a state that is joyful and detached and allows the creative process to flourish. How can a painting, a work of art, be said to be a service to humanity? Benjamin Creme was a man (and an initiate), precisely right for his time but also far ahead of our times. He was born, lived and worked at the right time, in that he was a way-shower and a prophet working precisely when needed. But he also threw light on the path that many now stand ready to tread – as humanity is growing into the realization that divinity is not only external to us but is immanent in all life. BC is mainly known for his work as a prophet, preparing the way for the emergence of Maitreya, the World Teacher. But he served equally as an artist, who combed the heavens and from those heights brought back the Golden Fleece, and through his painting revealed aspects of life which we may be able only dimly to intuit. Through BC’s close contact with his Master lives have been enriched and expanded, imbued with new qualities. This is what genius is – the ability to touch the mysteries and bring them back down to earth for others. “Art is not propaganda, however skilful, for any cause, however good. Art is not the imitation or description, however exact, of natural phenomena, or natural effects. Art is the creation, or setting in motion, of causes.